Having travelled overland to Gozo with mixed experiences for the past two years, I felt a change was in order. I first investigated the freight ferry that plies between Southampton and Limassol (5B4) and discovered it takes best part of a month for the round trip (even though affordable). Next, I looked around for somewhere not too far afield where I could have a stab at an open entry from an essentially ready-made station. Approaching first of all Jeff VY2ZM, whose amazing 150 acre station on the NE shore of PEI is well-known throughout the world, I was initially put off by his dire predictions of the March weather, the modest chance that any significant antenna system would have survived the winter and his graphic description of typical road conditions to the more remote parts of the island. 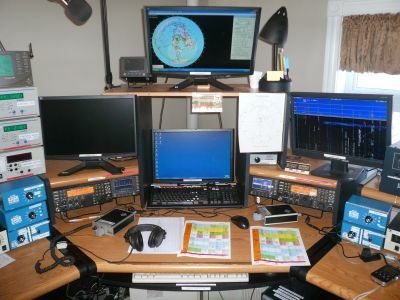 With due respect to all the other VY2 stations, there are really only two which are able to compete effectively in the major contests: Jeff himself (who has won 96 of the 100 or so he has entered over the last 10 years) and Ken K6LA’s VY2TT station which is located at the opposite end of the island to Jeff’s. VY2TT has also been in place for around 10 years and is now available as a rental shack, although few have operated from there over the winter months (which extend from October to April). The site occupies a little over an acre of ground, but shows just how much hardware can be shoe-horned into such a restricted site. At least 3 independent 4-7 element beams are in place on each of the HF bands together with a somewhat condensed 4-square for 80m and a full height Titanex for 160m. 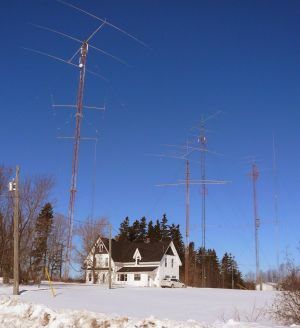 Small receiving arrays have been operational until recently, however these succumbed to the Winter 2014 storms and Ken encountered severe noise issues on 80 and 160 during the ARRL DX CW and SSB events in February/March. So, a good station was available for the BERU weekend, located within reasonable distance and with good paths to the UK. Was it affordable? 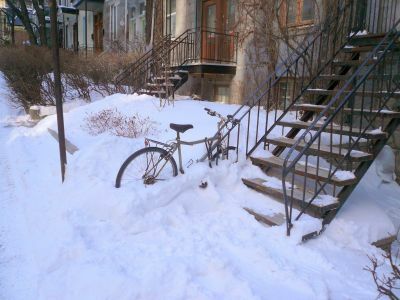 The weekly rental of US$1000 seemed good value for access to so much hardware, as well as a palatial 4 bedroom lodge with all mod cons, however the airfares in and out of Charlottetown (capital of the Province of PEI) in March were anything but! Diligent scouring of the web revealed an Air Transat return flight between Paris and Montreal for 375 euros, which seemed a reasonable starting point. 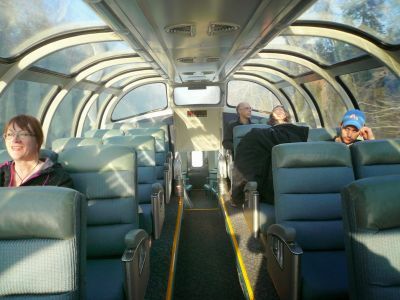 Adding senior eurostar return fares from Ebbsfleet to Paris and Montreal to Moncton, NB on the ‘Ocean’ scenic train (20 hours) still left a small balance in the decreed budget for the trip. This would be the first time in 57 licensed years that I would have access to a station with more than a single radio and fixed wire or vertical antennas and with this in mind, 4 full days of initial settling in were built into the itinerary. Having successfully taken my Industry Canada VE licence test courtesy of Jeff VY2ZM (also an accredited volunteer examiner) I arrived at VY2TT on the Tuesday before BERU to await issue of my callsign and get to grips with the intricacies of a modern, fully automated station. Ken was on his way to catch his flight back to LA after ARRL DX SSB and so there was a bare half hour available for an introduction to the station, lodge, water and heating systems and other housekeeping arrangements. At this point, I would recommend ensuring that adequate hand-over time is available when taking possession of a station with an absentee owner. Things started out very well indeed! By Tuesday afternoon, VY2GQ had disappeared from the Industry Canada available VY calls web page but the new owner was still awaited on the list of accredited licensees. Unbelievably, this was remedied by the following day and the spectre of having to use the CEPT route as VY2/G3LET disappeared! On the other hand, Ken had mentioned the noise problems he had encountered on 80m and the fact that the well water supply could freeze under especially cold conditions. Immediate attention was given to these areas, especially as the outside temperature had dropped to -22C. Sure enough, no water! Ken had recently installed some excellent heat exchangers in the lodge, mainly to save on costly heating oil. As a result the temperature in the cellar area where the oil furnace is located had fallen well below freezing. No problem, Ken emailed, just turn the furnace back on and the water will be running in a few hours. Three days later, after an overnight warm front, water reappeared in the taps! In the meantime, habits from VP8 living came in useful; buckets of snow from the drifts surrounding the lodge were melted on the kitchen range and served to fill the toilet cisterns and bottle up for use as drinking water. While all this was ongoing, a manic effort was mounted to find the source of the 80m noise, which was continuous at S6 – 7. First line – pull all the 20 or so wall warts that didn’t directly supply station equipment. Maybe half an S point of improvement, in fact the main noise structure looked a lot cleaner. The main power switchboard was nowhere to be seen and wasn’t mentioned in the station documentation. By the time I had a reply on this from Ken it was Wednesday. Localising the noise to one of the breakers involved numerous return trips through the trapdoor to the cellar but eventually an unmarked 20A breaker was identified as the culprit. Now, what did this supply do and how important was it? Tracing the wiring was non-trivial but eventually it appeared to be heading towards the standby diesel shed, located about 50m from the station through undisturbed waist high snow drifts. I concluded that some low-bidding contractor had probably installed a switch-mode trickle charger for the starting battery and so the breaker stayed off. The result was magic, 80m noise was now below S1! Just as I was congratulating myself, another S5 – 6 noise of an entirely different character appeared, off-site to the east, where was located a somewhat disreputable looking car muffler repairer. Not having a sniffer of any type made further investigation difficult and so a mental note was made to always carry one of these on a trip. Anyway, this noise disappeared at going home time, so another big sigh of relief. OK, down to the business of making sense of the station, clearing the desk of keyboards and similar junk and finding space for log and bonus/dupe sheets and the two keyers I had packed, one for each of the K3 radios in the SO2R ops position. There was supposed to be a manual SO2R facility but this proved not to be the case and all the station switching was controlled by Writelog. A manual headphone switch was therefore contrived, giving a choice of full emphasis on the run radio and partial stereo separation from Radio 2 for use when searching. This was OK, but didn’t allow use of the K3’s AFX facility, which I really prefer under difficult signal conditions. Still, the elements of a workable system were now in place and so I settled down to run JAs on 10m as an initial introduction to a proper station. Wonderful conditions, I hoped they would last another two or three days. After an hour, BANG! and off went the main power. No batteries in the torch by the cellar ladder and so I set forth to Foodland in the local strip mall a couple of miles away for replenishment. Down in the cellar, the main power breaker had tripped. It felt a bit loose but would eventually go back in. OK, off with EVERYTHING else, including heating, fridge and all other housekeeping items. This time it only lasts for 30 minutes or so and tripping is again precipitated by running with one of the Alpha 87a amps at half bore (750w is the maximum legal power in VE). And so, I try to remove a strange 100A breaker from an even stranger distribution board. Jeff VY2ZM is only a local phone call away and provided valuable advice, but from over 100 miles away on the other side of PEI. Jeff’s 1 mile long drive is only passable by skidoo at this time of year. Anyway, out comes the breaker to see if it can be fixed. The temperature sensor is clearly faulty, with the measured power passing through it at less than 50 amps. It’s all rivetted up and so back it has to go. It will stay in as long as the station isn’t keyed and so at least there is heating! A call from Jeff to Ken in LA produces an electrician at the door by 20.00 the same day (Wednesday). The guy is equipped with a fancy head lamp but no spare breaker. May have to order up one of those old things, he mutters, but I have a feeling there’s one in the back of one of our vans – I’ll be back in the morning. Thursday comes and goes with no chance of any more station operation and so does Friday until 19.30, when a decidedly second user breaker appears and is fitted. With everything switched on and after half an hour of concentrated keying, it is pronounced fit for purpose and so I can at last spend a couple of hours setting up the antennas, loading AZMap on one of the station computers and laying out the log and bonus sheets before it is time for a quick snooze in anticipation of the 6AM start. In the end, I’m up by 5AM for my first look at early morning conditions from VY2. Everyone says work out 80 and 40 first of all but there are amazing happenings already on all the HF bands. Still, I do as I’ve been told and resist 20 and 15 for best part of an hour. Just as well, as I’m one of the lucky handful to catch Nigel on 80m before his antenna hits the dust! But driving all these antennas and wielding 2 radios takes it’s toll on the bonus/dupe sheets, which don’t really do me a lot of good. After a couple of hours, I’m well behind the leaders and starting to feel I’d have preferred another trip to Gozo. Although the station is fully able to accommodate searching while running, the operator was found distinctly wanting for most of the first 12 hours! Anyway, by that time I’d caught up to within 20 or 30 QSOs of Nigel and John VE3EJ, but what about the bonus tally? I have absolutely no idea and calling any suspected new bonus is often a leap in the dark! Inevitably, I started to lose ground again and ended up 50 or 60 behind, with another 30 or so probable dupes on top. More lessons learned – preparation cannot be left until the last minute! But, c’est la vie as they say in Montreal, where I spent a couple of relaxing days waiting for my flight home. Conditions were absolutely wonderful and I’ve never experienced SP and LP conditions to VK/ZL anything like it, with more of these worked in 24 hours than ever before. Using VY2GQ felt good and Ken G3RFH, ex-Radio Officer on Ice Patrol Vessel HMS Protector, even recognised me from my BERU excursions from VP8 in the early 1960’s. After post-entering the log into SD a week later, the bonus total at 295 was my best ever, giving a final claimed score of 11,595 which I was entirely happy with under the circumstances. The only slight disappointment from the trip was that in March, the ‘lobster capital of the world’ as PEI is described in the tourist literature, doesn’t entirely live up to its reputation. ‘Come back on 1 June when the season starts’ was the cry . . . Wish I liked IOTA as much as BERU!